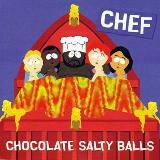 A whole younger generation would know very little of his until he landed the role of Chef in the adult cartoon South Park. Fritz the Cat, in 1972, demonstrated a market for adult cartoon features, admittedly aimed at the student population, but it wasn’t until South Park that the medium became really popular. It was created by Trey Parker and Matt Stone and recounted the exploits of the 10-year-olds Stan, Kyle, Cartman and Kenny. Going against all conventions, Kenny was killed in most of the episodes, only to reappear in the next. The script was packed with vulgarities, sexual humour and comic violence, never more so than in the film, South Park: Bigger, Longer and Uncut, in which the USA wages war on Canada. The film is noted for its grotesque parody of Disney musicals with Satan’s Up There. Isaac played Jerome McElroy, otherwise known as Chef.